You can shrink 100-percent cotton jeans using the same techniques you use to clean them. Jeans made of 100 percent cotton can shrink more than a full size if the fabric is not pre-treated to be shrink-resistant. 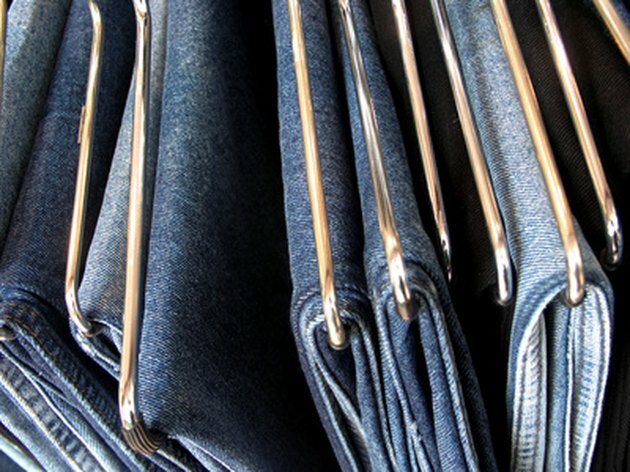 Even cotton jeans with shrink-resistant treatment will shrink slightly. Find out whether you can expect your cotton jeans to shrink a lot or just a little by reading the care tag. Labels indicating shrink-resistant, acid wash and stone wash tell you the jeans will only shrink a little bit. Fill the bucket or washing machine with hot water. Add the laundry detergent if you want to wash the jeans while you are shrinking them. The hot water is the important part in shrinking the cotton fabric. Let the jeans soak in the bucket for 15 minutes, or let the washing machine run through the normal hot water cycle. If you are using a bucket, drain off the soapy water and rinse the jeans with cold water. The washing machine should rinse the jeans in the rinse cycle. If you are using a bucket to shrink your jeans, wring the excess water out of the jeans. Drape the jeans over the clothesline, and let them air dry for approximately an hour. Put the jeans in the dryer on the medium heat setting, and let the dryer run until the jeans are completely dry. Using the dryer is optional for shrinking cotton jeans because the hot water used earlier will shrink untreated denim. Remove the jeans from the dryer as soon as it stops to prevent wrinkling.